Discovering the landscape: cut it out! Over the past few years, my colleague Jen (Landscape Institute Archivist) and I have been working to integrate the library and archive of the Landscape Institute into the collections of the Museum of English Rural Life. The LI collections are rich and varied, including material such as books, pamphlets, periodicals, press cuttings, minutes, membership lists, financial papers, Institute publications and a slide library. 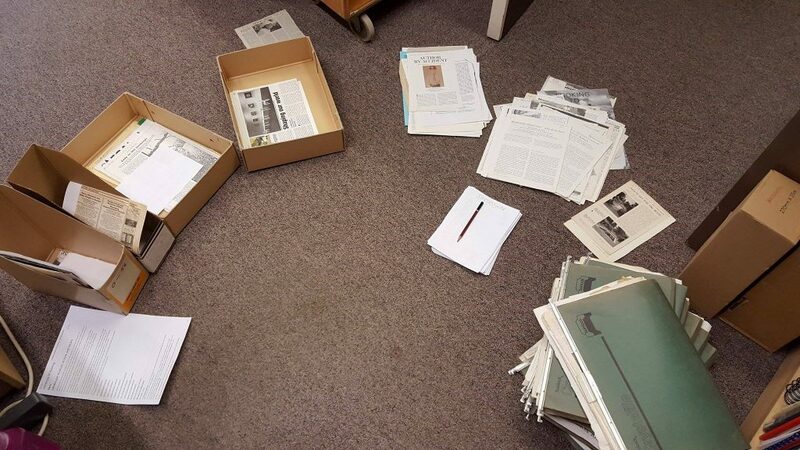 Now the time has come for me to sort out the Landscape Institute cuttings collection. In a library context a cuttings collection is most likely to include articles cut out of newspapers or other periodicals, or press cuttings. It is also likely that other types of ephemera will find their way into a cuttings collection, such as offprints (reprints of articles from editions of a publication), leaflets, advertisements, catalogues or posters. A collection such as this arises from individuals cutting out relevant articles and compiling them. So they are a kind of personally (or institutionally) curated collection. 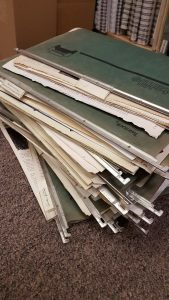 A lot of us are likely to have done this ourselves – cutting out and keeping articles of printed material that have a personal connection or are of local interest. Therefore we treat cuttings as a library collection, as they are culled from printed material. 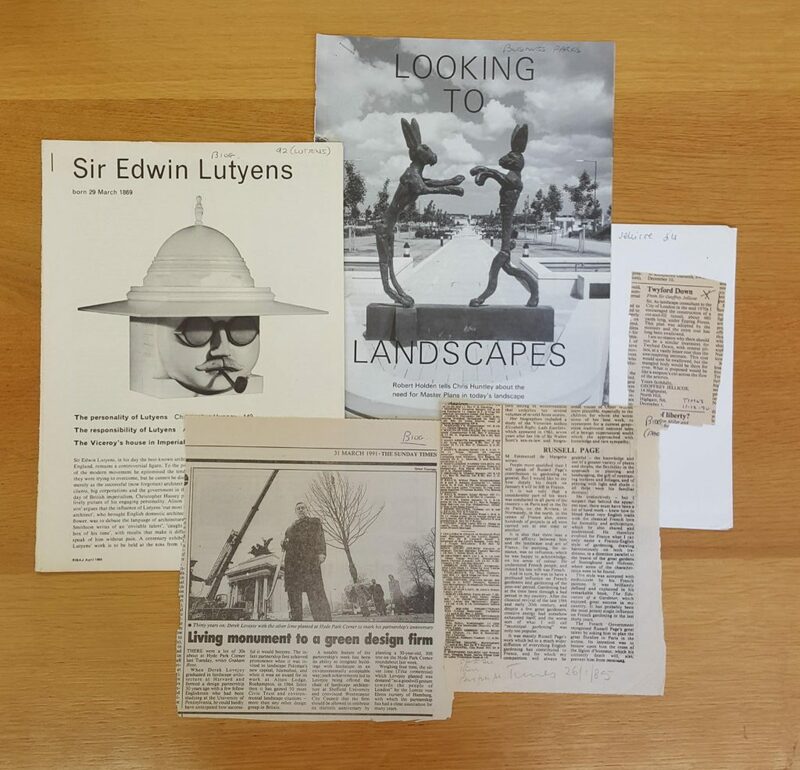 The LI cuttings collection includes material from the 1960s to the early 2000s. It includes a lot of biographical articles on leading landscape architects, especially obituaries. 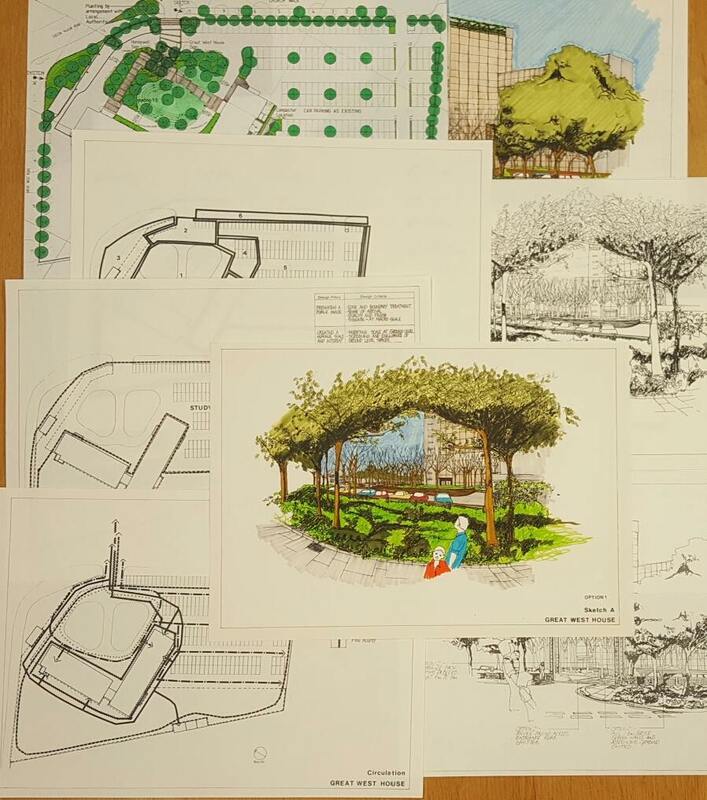 This is alongside material on policy affecting the work of the landscape architect and features on particular parks, gardens and landscape projects. Does the MERL Library hold any other cuttings? 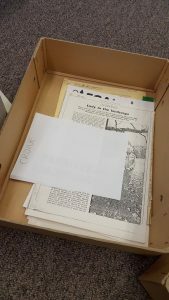 Yes we hold a MERL Library cuttings collection which we still add to. This is in filing cabinets in the Reading Room and is organised in a sequence based on the MERL Library subject classification scheme. Cuttings can be a problem for librarians! Their ephemeral and often flimsy nature can make their provenance difficult to attribute, while storage and organisation can also be a challenge. Nonetheless, it is precisely the ephemeral nature of cuttings that make them so valuable to researchers. 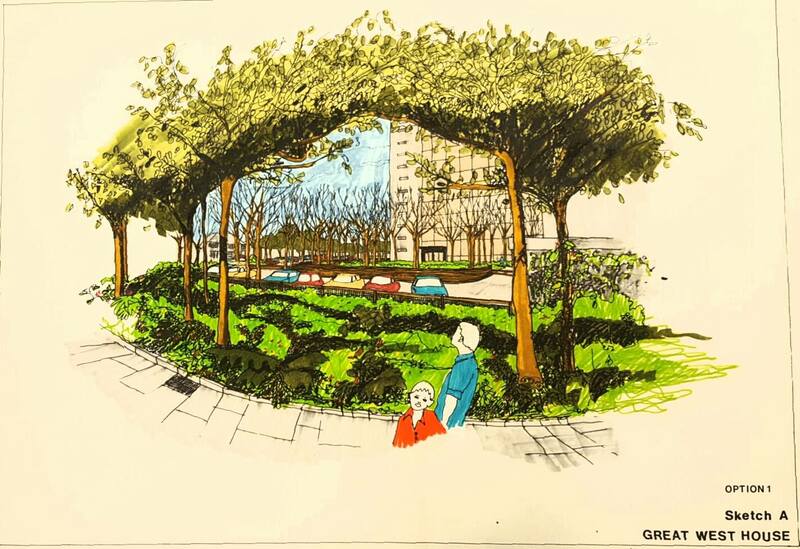 There is no better insight into contemporary views and public opinion on landscape architects and their projects than by reading what was being written about them at the time. Of course, a lot of this material will now be available online or elsewhere. Still this collection is of historical interest in itself, as a record of what the Landscape Institute felt it was important to cut out and keep. When will the cuttings be made available? I am currently about 25% of the way through sorting the LI’s collection of hundreds of cuttings! Thankfully I have a wonderful volunteer, Tina, who is going to help me with the project. Together we will be numbering, listing and repackaging the cuttings. I would hope that this project will be completed towards the end of the year, but please get in touch via merl@reading.ac.uk if you are interested in using the collection before then. The MERL and Special Collections Open Access Library is now fully accessible again! 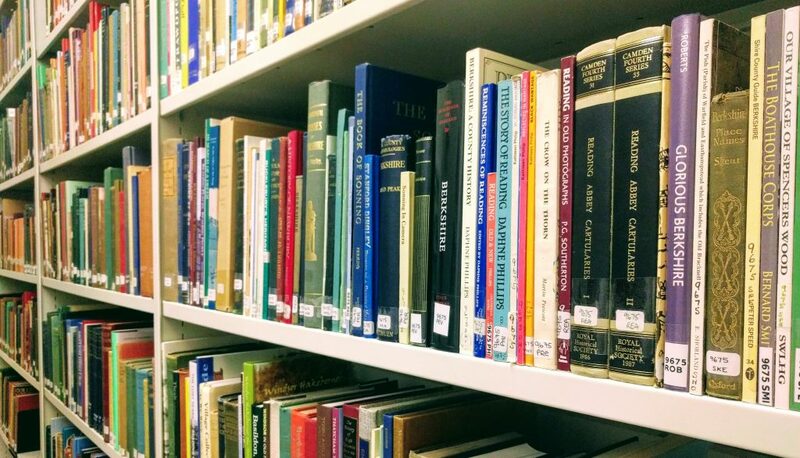 In this library, which can be accessed from the Reading Room, you can find reference works relating to our Special Collections and to Samuel Beckett, as well as the library collection of the MERL, consisting of about 50,000 books, pamphlets and periodical volumes. We have been working hard to improve the layout of these collections to make it easier for you to quickly find the items that you need. We have also been able to create more space for future purchases and gifts. We would like to thank our readers for their patience while the works were taking place. 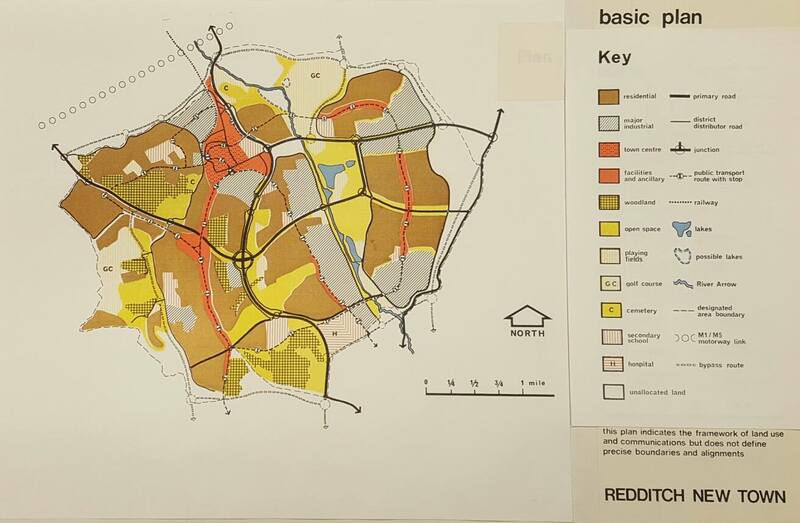 In this post Amber Roberts, recipient of MERL’s landscape academic engagement bursary talks about her work on our Michael Brown collection (Landscape Institute collections). Michael Brown’s work is unfortunately little known to today’s landscape architects. Thanks to a generous research bursary from MERL I have been able to delve into his archive and begin to uncover Brown’s idiosyncratic approach, his lost landscapes and his lost research. The art and aesthetic delight of landscape must emerge out of solving down to earth problems elegantly and simply. With this focus on the solution of ‘down to earth problems’, his work navigated the complex tensions of the profession that existed both then and now by advocating an objective, theoretical and interdisciplinary approach. If spaces between buildings are to be used to their best advantage it is essential that methods of analysis and comparison be evolved which will enable the designer to analyse the functions and uses of external spaces very rigorously. This approach is particularly evident in his work at Livingstone Road, London (1962 and later awarded a Civic Trust Award 1968) developed with the architects George, Drew and Dunn Partnership, a project that is due to be lost to a £300m regeneration project. By undertaking a disciplined survey and analysis of the site Brown identified key issues and opportunities that ranged from the particular microclimate of the site to cut and fill balance and pedestrian movement lines. Brown interwove this analysis with the ‘Court House Concept’ of his tutor McHarg to develop a series of spaces that were given careful detailing landform and levels to create a range of soft spaces. Beyond the layout of the courtyard system of open space, Brown sought to foster a sense of ownership for the spaces among the new residents. This was a key approach of Brown’s that he had begun to develop during his early British work with SPAN Housing. Brown himself became a resident of Fieldend and member of the Resident’s Association for the upkeep of the landscape within the estate. The courtyards at Livingstone Road were each given a distinct character and function that was embellished with sculptures and wall panels and Brown actively promoted a resident’s association for the scheme. Overall Brown had a deeply personal and idiosyncratic approach to landscape, his publications and designs offered exemplary solutions responding to complex issues from housing and motorway design to the design of public squares. Each of which combined his joint skills in architecture, urban design and landscape. Brown’s breadth of projects are testament to his rich and varied experience merging together disparate ideas and skills. This research on Brown will be presented with Lead Researcher Dr Luca Csepely-Knorr at the Society of Architectural Historians Conference in Glasgow next month. Find out more about Amber’s work or our Landscape Institute.